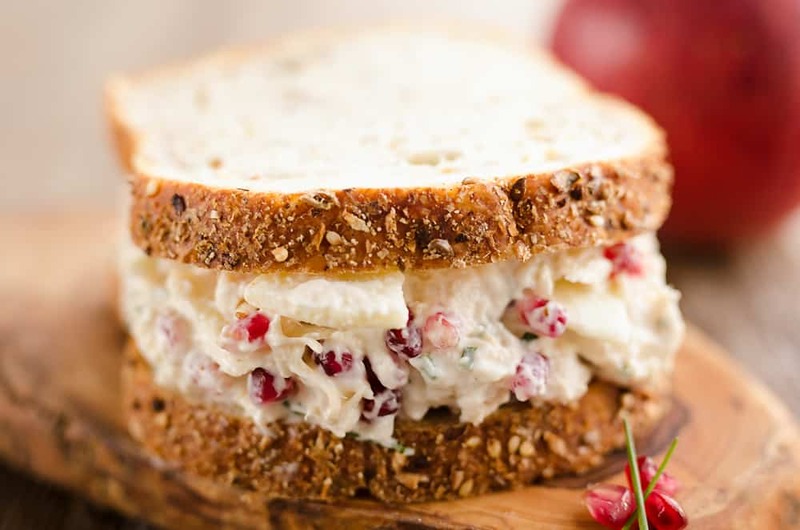 Pomegranate Apple Chicken Salad is a healthy recipe bursting with flavor and texture. 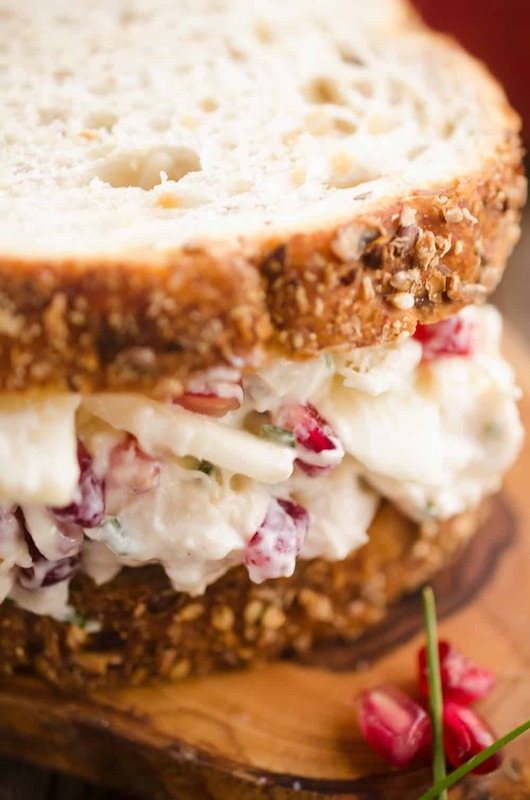 This easy 10 minute lunch is made with Greek yogurt and fruit for a lighter meal you will love. It’s that time of year where the berries and fresh fruits are fading in quality fast and rising in price. That doesn’t mean we can’t shift and enjoy the few seasonal fruits that are in their prime though! Pomegranates and apples are at the top of that list and are at their peak right now. I still have a big box of apples from my tree that are getting used up on the regular for desserts like this Apple Cake or classic Apple Crisp. 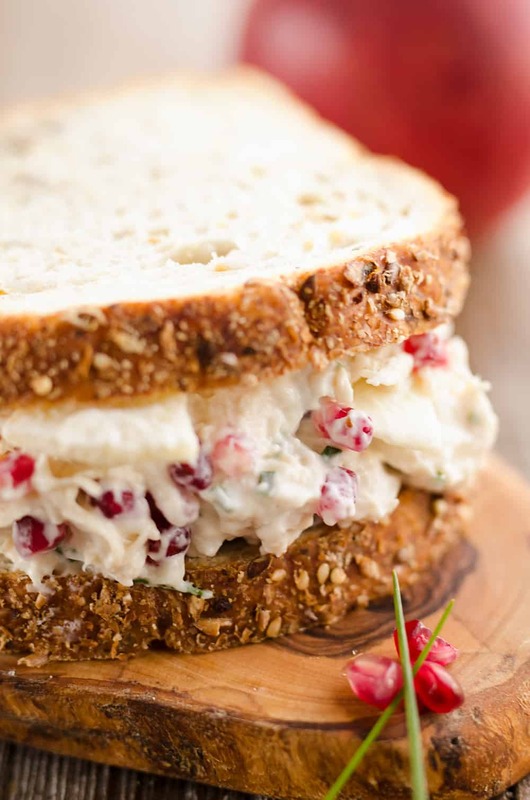 They are also great for savory meals like salads and this Pomegranate Apple Chicken Salad. I love a good homemade chicken salad, but for some reason I don’t get around to making it very often. 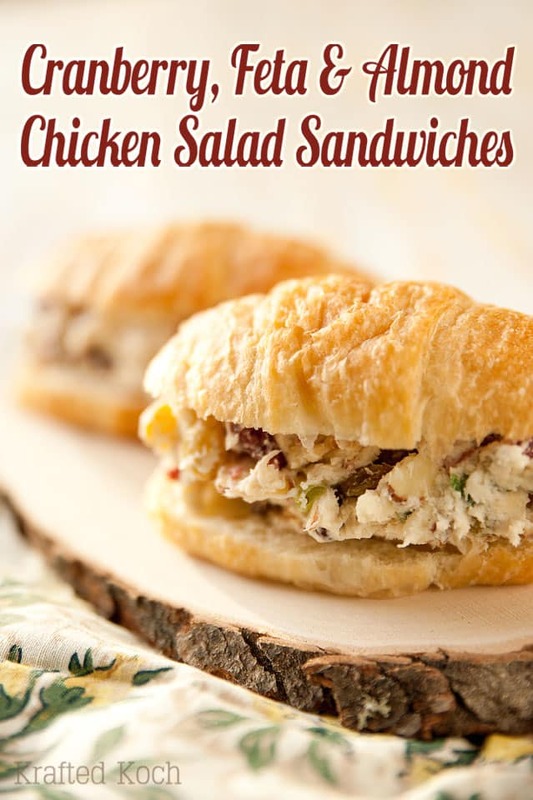 This BLT Chicken Salad is the perfect example of a recipe I adore, but haven’t made in awhile. 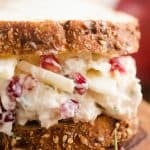 That definitely needs to change though, because chicken salad is the perfect last minute meal for dinner and packs up wonderfully for lunch the next day. 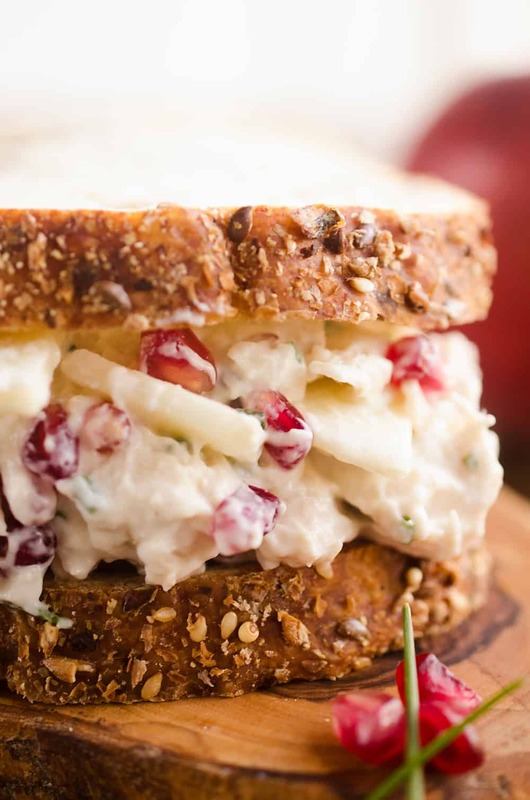 I am truly obsessed with this Pomegranate Apple Chicken Salad. 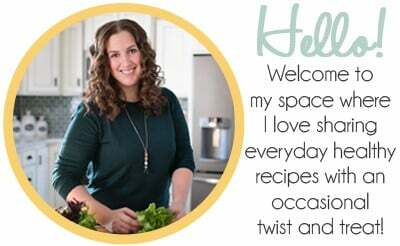 It’s a wonderful low-fat recipe that makes for a fantastically healthy meal and tastes AMAZING. The pomegranate seeds add an amazing crunch like a nut normally would but you get the health benefits and antioxidants of pomegranates. The apples are a nice tart crunch as well, paired with the creamy Greek yogurt and tender chicken. It’s the perfect balance of flavors. 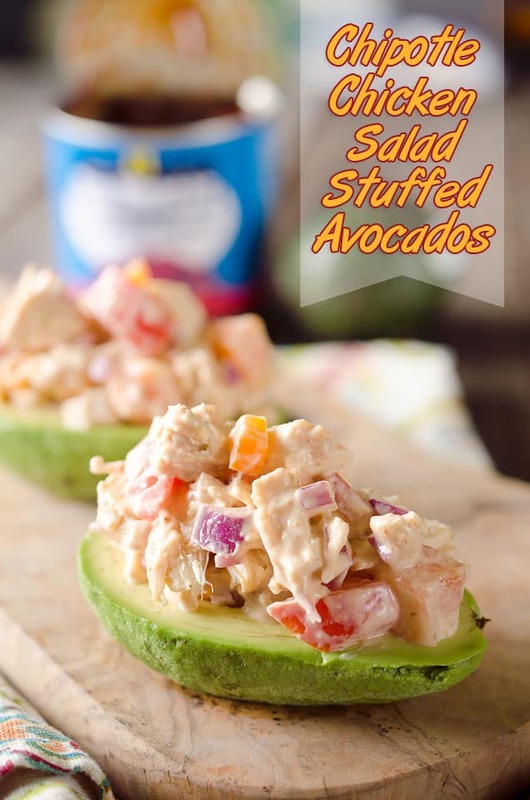 Whether you slather this on some whole grain bread, pile it in some lettuce cups or enjoy it with crackers, it is a recipe you are sure to make it again! In a medium bowl, whisk together the mayonnaise, Greek yogurt, vinegar, salt, honey and chives. Mix in the chicken and apples until well coated. Gently fold in the pomegranate seeds. Serve on bread, lettuce or with crackers. 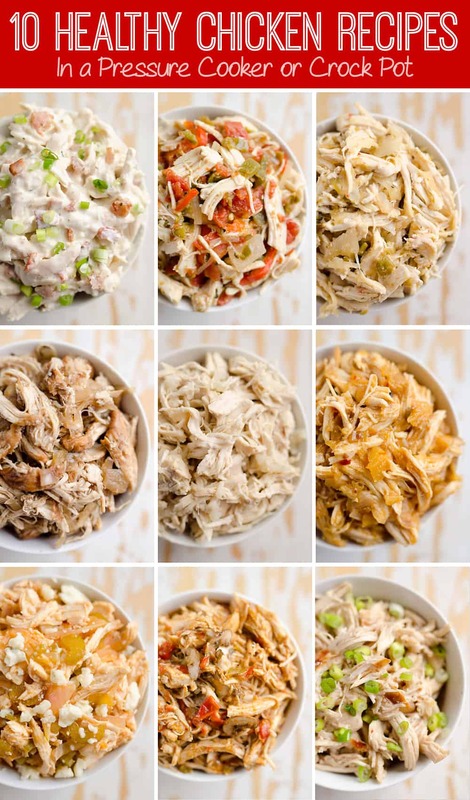 More great chicken salad recipes! I have a confession…I’ve never tried a pomegranate! I think this looks like the way to try it! I absolutely love chicken salad!! I’ve never tried it with pomegranate before, this looks so good! MOUTHWATERING! Perfect combination. Pinning this for later. Just tried this today and LOVED IT! So good! Going to share on my blog.